On this second week of the 2019 Spring Pledge Drive, The Labor Forum hears from organizers of the Coalition of Immokalee Workers Fair Food Tour which is coming to Atlanta today to bring attention to the failure of Wendy’s fast food chain to support the human rights of Florida farm workers. From 5-6, farm worker families will be joined by students, members of the faith community, and labor and community organizations in a demonstration at the Wendy’s, 660 Boulevard (near Ponce de Leon). Following the picket, there will be a community dinner at Grace United Methodist Church, 458 Ponce de Leon Ave. NE from 6:30-8:30pm with the CIW members discussing the Fair Food Program and the ongoing struggle to win Wendy’s over to joining it. This interview, will be from 4:15-4:30pm. Our guest from 4:30-4:55 is Michael Yates, an economist, labor educator, and associate editor of the socialist magazine Monthly Review. Michael was born in 1946 in a small coal mining town about 40 miles north of Pittsburgh, Pennsylvania. His immediate family had a long history working at dangerous, unhealthy jobs in the coal mines. For more than three decades, he has been a labor educator, teaching working people across the United States. The Labor Forum team will talk with him about his views on what the changes in types of work, particularly the gig economy, mean for union organizing and movement building in the US and around the world. WRFG 89.3FM is a community, commercial free radio station, supported by our listeners for close to 46 years. YOUR donations allow us to provide our listeners with the widest range of music on any station in Atlanta and beyond as well as public affairs programs like The Labor Forum, committed to bringing the voices, issues and solutions of working people to the airwaves. 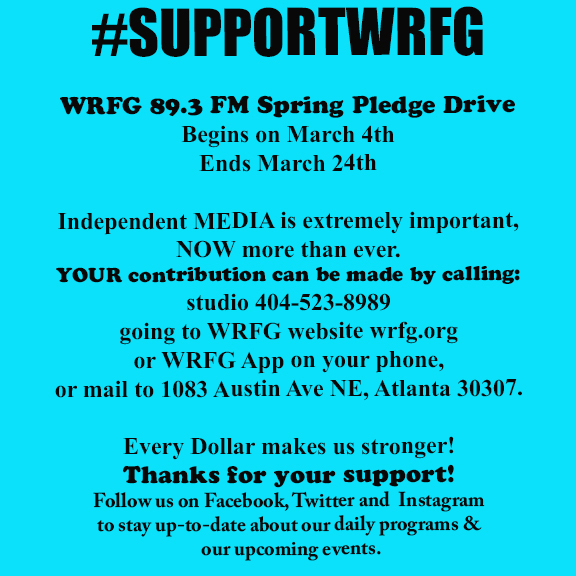 PLEASE make a contribution by calling 404.523.8989 anytime or going online at wrfg.org and following the Donation prompts. Checks can be mailed to 1083 Austin Ave NE 30307. Thank you in advance for helping to keep WRFG on air and the bills paid! Farmworkers in Florida have organized for living wages and decent working conditions for years under the leadership of the Coalition of Immokalee Workers. Many growers and grocery store chains and restaurants that use the tomatoes they pick have signed onto the Fair Food Program which has brought significant improvement to the lives of these hardworking men and women. But not the fast food chain, Wendy’s. On Monday, March 11, Florida farmworkers will be joined by Atlanta students, members of faith communities, labor and community activists in a demonstration in front of the Wendy’s at 660 Boulevard Ave. NE from 5-6pm. Following the protest, there will be a Community dinner at Grace United Methodist Church, 458 Ponce de Leon Ave where farmworkers will describe their ongoing fight for human rights as well as the victories they have achieved. The Coalition of Immokalee Workers and Freedom University Georgia are sponsoring this social justice action. This past Friday, the World Federation of Trade Unions at a conference Istanbul, Turkey issued a strong statement of solidarity with the elected government of Venezuela and its president, Nicolas Maduro. The No War On Venezuela social media platforms have many pictures and reports from the more than 153 solidarity events held on Feb. 23 around the world. It’s worthwhile to check it out. Over this past weekend, Oakland education workers declared a victory as they voted to approve agreements after a seven day strike that began on Feb. 21. Similar to the more than 20 strikes and job actions that have taken place in the last year, rocking the public education system in the US, the Oakland teachers’ demands centered on students’ needs for smaller classroom sizes and other resources, low-pay and privatizing of public schools. According to the Oakland Education Association, the contracts mandate an 11% pay hike over 4 years with an immediate 3% bonus, a phased in reduction in classroom size, funds for additional counselors, nurses and other support staff, a moratorium on approving charter schools and a 5 month pause in the plan to close 24 schools. A number of teachers were not satisfied with this particular element of the agreement, wary of losing the momentum of the strike to bargain for a real halt to the closures. Tonight the agenda of the Atlanta School Board includes the proposed Excellent School Project, a system of grading schools to identify those that don’t meet certain standards and thus subject them to a number of remedies including being taken over by a charter organization, closed or merged with another school. The teachers’ union, American Federation of Teachers and other education associations have declared this to be a public relations stunt without addressing the need for resources such as smaller classroom sizes, safe and fully-equipped buildings, sufficient supplies, books and technology for each student, additional staff such as counselors, nurses,librarians, art and music programs and a pay scale that enables teachers to live without needing to get a second job or be forced to quit. Despite recent state budget upgrades, Georgia still provides less funding for K-12 than before the recession more than a decade ago, taking in account inflation. The Excellent School Project is regarded by many teachers is regarded by many teachers to be a cover for turning more public schools over to charter operators who are privatizing and profiting from public education money. The Community Comment section of the APS meeting is from 6-8pm at 130 Trinity Av. In downtown Atlanta. To sign up to speak, you have to turn in a form between 5 and 5:50. On Monday, March 4, The Labor Forum will discuss how working class families are impacted by police shootings. Specifically we will be speaking about the cases of Anthony Hill and Jamarion Robinson, two young Black men in Atlanta whose killings have raised community outrage at the circumstances of their deaths.Us Protecting Us, a coalition led by members of the disability community, was formed four years ago after Hill, a veteran suffering from PTSD and other mental illness, was shot by DeKalb County officer, Robert Olsen in the parking lot of his apartment complex. Although Hill was naked, Olsen claimed that he was in fear for his life. We will hear from Us Protecting Us members about events marking the four year anniversary of Hill’s death, March 9 and mobilizing for the upcoming murder trial of officer Olsen.This interview will be from 4:15-4:30.Monteria Robinson will join the program at 4:30 to talk about the death of her son on Aug. 16, 2016 by a combined force of US Marshals and local police seeking to arrest him on an outstanding warrant. Yet he was shot dozens of times in his girlfriend’s apartment, although offering no resistance. For two and a half years, those involved in the shooting have refused to be interviewed by the Fulton County District Attorney’s office. Monteria Robinson will update the Labor Forum audience on what steps are being taken to reveal the truth of what happened to Jamarion Robinson. The Labor Forum airs every Monday from 4-5 pm on WRFG 89.3FM.The WRFG Spring pledge drive begins March 4 until March 24 and all those who support progressive, independent, community radio are encouraged to make a generous donation to this 45 year old, all volunteer institution. You can call 404.523.8989 any time or go online at wrfg.org or on our mobile app. 1083 Austin Ave NE, Atlanta 30307 is the address for mailing your contribution.